The International Institute for the Advanced Studies of Psychotherapy and Applied Mental Health (International Institute) is an excellence postdoctoral and research Institute of the Babes-Bolyai University (BBU), located in Cluj-Napoca, Transylvania-Romania. 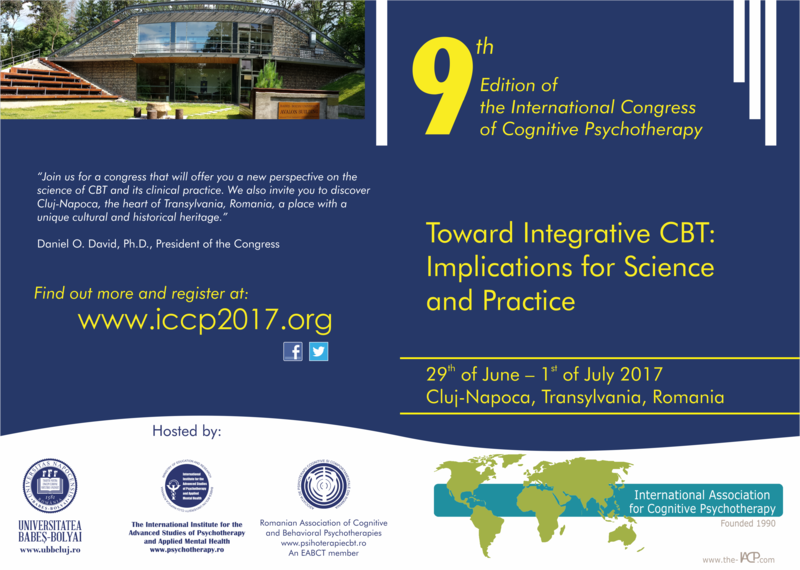 More precisely, the International Institute for the Advanced Studies of Psychotherapy and Applied Mental Health is the international spearhead – an academic spin-off – of the Department of Clinical Psychology and Psychotherapy of the Babes-Bolyai University and the research platform of the Evidence-based psychological assessment and interventions doctoral school of the department. The Institute has two world-class research Platforms: (1) Robotherapy and Virtual Reality Therapy Platform (the Matrix Platform) and (2) The Platform for Advanced Imaging – MRI/EEG – in Clinical Cognitive Sciences (the SkyRa Platform) and an advanced Clinical Research Unit. The Institute is included in the MERIL Platform. The MERIL Platform is an inventory of “…the most excellent research infrastructures in Europe, of more-than-national relevance, across all scientific domains…”. Also, its Laboratory for the Research of Sleep Disorders is certified by the European Sleep Research Society. Babes-Bolyai University is one of the oldest, most prestigious, and influential academic settings in Romania and in Eastern-Central Europe. It has been almost five centuries since the beginnings of this university of Cluj-Napoca. The first project to set up a higher education institution in Cluj-Napoca was recorded in 1565, and in 1581 an academic college was set up, organized and run by the Jesuits. Since then Babes-Bolyai University has become a modern institution, acquiring remarkable fame by its long-time achievements at national and international levels. The International Institute aims to promote advanced study and scholarship in psychotherapy and applied mental health by postdoctoral training and research, following a scientist-practitioner and a clinical science paradigm. It offers training and conduct research in personalized evidence-based psychotherapies and other mental health applications. The general framework of health/illness is based on a multilevel approach (i.e., neurogenetic-cognitive sciences-cross-cultural), technologically immersed. The health focus also includes a strong CBT psychological coaching aspect, by its affiliated International Coaching Institute. Mental/psychological disorders are one of the leading causes of disability and mortality. The landmark “Global Burden of Disease” study, commissioned by the World Health Organization and the World Bank, shows that 4 of the 10 leading causes of disability for people aged 5 and older are psychological disorders. Among developed nations, about twenty eight percent of the adult population and twenty one percent of children meet the full criteria for a mental/psychological disorder (Mental Health: A Report of the Surgeon General, 1999). Billions of dollars are spent annually for the prevention and the treatment of psychological disorders and for research in order to develop better interventions and improved services for diverse clinical populations. Evidence-based medicine (EBM) is the integration of best research evidence, based on controlled clinical studies, with clinical expertise and patient values and preferences. The number of publications on EBM has grown exponentially during recent years, and international interest has led to the development of several influential EBM journals that summarize the most relevant studies for clinical practice. Personalized medicine is a model that argues for the customization of healthcare, with decisions and practices that are tailored to the individual patient by use of psychological and/or biological (e.g., genetic) information. Thus, the current new directions in the mental health field are based on personalized evidence-based interventions. The field of psychotherapy research is now at a stage where the efficacy and effectiveness of treatments have been demonstrated for a large spectrum of disorders (see American Psychological Association, Division 12; the NICE Guidelines; Cochrane Reviews). The International Institute will make a priority of finding and disseminating personalized evidence-based assessment strategies and treatment approaches. The International Institute will invite as affiliates/partners prestigious organizations involved in the development of evidence-based psychotherapy and applied mental health interventions. Albert Ellis Institute, New-York, USA, is our first partner. Babes-Bolyai University and its International Institute for the Advanced Study of Psychotherapy and Applied Mental Health honor Professor Aaron T. Beck on his 95th birthday!